Richard Marzten is a rags to riches cautionary tale. Plucked from the blue collar and black lung reality of his childhood in a rural Pennsylvania mining town, Richard marries up in the form of Monica, a very wealthy and slightly older woman. Gifted with the ability to live a life of leisure, Richard at least has the self-respect to earn his keep. But as the years pass, their effects cling to Monica, clawing away at her youth and propelling her into a matronly and unflattering state of being—at least in the eyes of her husband. Though he loves his family, which includes an increasingly sullen teenage daughter, Monica’s slowly expanding, pasty, doughlike body is becoming more and more repellant to her husband. After careful consideration, Richard becomes convinced that he will be the first man to have his cake and eat it, too, and embarks on a failsafe plan to have an affair. After a rather genius preamble to his scheme, he places a discrete ad targeting married women who are seeking sexual escape with no strings attached. After wading through piles of responses from overweight and unhappy housewives, Richard happens upon Gretchen Trekker, a gorgeous, well-kept woman ensnared in a similar posh-yet-unsatisfying marital situation. As with all things that seem too good to be true, so is Gretchen. As Richard’s cake begins to crumble, he is catapulted into a whirlwind of lies, deception, and fear, eventually finding himself fighting to hold on to the life he so recently took for granted. Having fallen under Mr. SaFranko’s spell after reading Hating Olivia, I wasn’t sure if he could pull off another riveting literary score, but I should have known better. Employing his usual signature style, Mark SaFranko has hit another dark and debauched homerun. 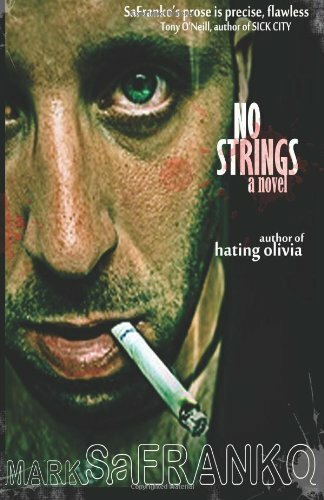 With a penchant for writing high maintenance female characters who always seem to exact their pound of flesh, Mr. SaFranko’s No Strings is a masterpiece of self-implosion. Possibly concocted from a random what-if thought, the author perfectly guides his protagonist through a slalom course of mayhem that would give any red-blooded American an anxiety attack at the mere thought, much less carrying out such a dastardly deed. As always, Mr. SaFranko’s crystal clear prose rises above any adjective, demanding praise aimed solely at itself, rather than a cast-off of comparatives to the work of others. Though his style has a strong hint of noir, his femme fatales rival those of any gumshoe and in this case, his protagonist, a fairly reliable, tunnel-vision-afflicted narrator whose main flaw is being an ungrateful prick, still manages to garner a little sympathy for his self-imposed plight. Regardless of Richard’s ingrate status, his offensive, misogynistic thought process and eventually his emotional break with reality, he’s still fallibly human; and although his actions aren’t condonable, they’re actually strangely understandable. Read in one sitting—it’s impossible to read Mr. SaFranko’s books any other way—this cautionary tale contains all the ingredients for scratching that seven-year-itch—and provides a fast-acting salve for chronic thoughts of infidelity. Not just another shot at the age-old conundrum of the grass being greener, No Strings is a 21st century Fatal Attraction that just might have you staying on your own side of the fence loving the one you’re with.